The holidays are so much fun and it all start with decorating. 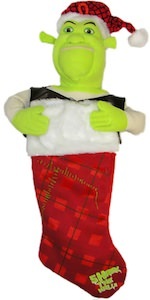 How much fun would it be to give you kid a Shrek Christmas stocking? They will stare in amazement when they see this 25″ high stocking with Shrek Sticking out wearing a Santa hat. So get ready to decorate and reserve a spot for the Shrek Christmas Stocking.